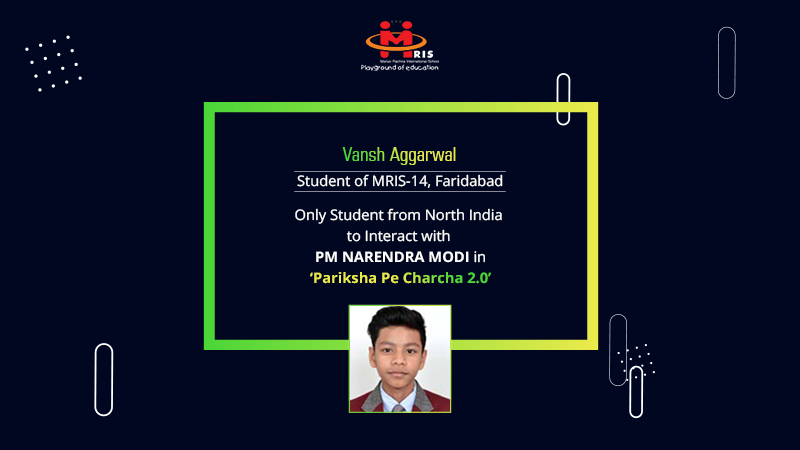 Vansh Aggarwal, Grade X student of MRIS-14, Faridabad had a golden opportunity to interact with the Honourable Prime Minister of India, Shri Narendra Modi in the second edition of ‘Pariksha Pe Charcha’ held at Talkatora Stadium in New Delhi recently. He was one of the four students selected for special interaction with PM Modi. Vansh was also the only student from Haryana and North India to get a chance to ask PM Modi a question. He marked his presence by asking questions on goal setting, positive thinking, dream fulfillment and many more. In this rendezvous, PM Modi replied that the students should know about their passion and try to get clarity about what they want to become in life by analysing themselves and taking help of others like their mentors or parents. Vansh was overwhelmed with the presence of PM Modi in the arena and experienced this interaction as the lifetime moment to be cherished with enthusiasm. This platform inspired him to tread on the path of success with a positive outlook.